The Shooting of Warren Earp by Johnny Boyett on July 6, 1900. Willcox Arizona Range News on July 11, 1900. -- as typed from a table at a Willcox BBQ restaurant. Warren Earp was shot and killed by John Boyett at 1:30 Friday morning at the Headquarter saloon. It was the culmination of an ill feeling which had existed between the two men for a number of years. From evidence given at the preliminary hearing that Saturday it developed that their last quarrel began in the restaurant in the rear of the saloon. Both men came into the saloon and Earp told Boyett that he (Boyett) had been offered $100 or $150 by parties in town here to kill him. Boyett denied this and told Earp he did not want any trouble, but added that if he had to fight him that he was not afraid. Earp told Boyett to go get his gun, and said that he was fixed. Boyette stepped out through the front door of the saloon, walked over to the Willcox House. The proprietor W.R. McComb was in the office reading. Boyett walked behind the bar and helped himself to a couple of guns, and left the room. Mr. McComb called to him to come back and asked him why he took those guns. He replied that he might need them and would return soon. Before Mr. McComb could interfere Boyett had already left the room. Boyett thereupon went back into the saloon, entering the front door and wanted to know where Earp was. Earp entered through the rear door and Boyett fired two shots at him. Earp disappeared through the same door he had entered; then he went from the restaurant through a side door out on the side walk and in a few minutes he entered the saloon again through a side door. He advanced toward Boyett. Opening his coat he said: "You have the best of this, I have no gun." Boyett told him repeatedly not to advance or he would shoot. Earp still kept advancing and Boyett backed off towards the front door. Finally Boyett again repeated his warning not to advance another inch or he would shoot. Earp not heeding, Boyett fired, and Earp dropped dead. The officers were notified and Deputy Sheriff Page, George McKittrick and Jim Hardin appeared on the scene. George McKittrick arrested Boyett and placed him in jail. Upon examination a pocket knife half opened was found in Earp's hand but aside from this he was unarmed. The next morning Judge W.E. Nichols impaneled a coroner's jury. Days later, Boyett was acquitted of any crime. So, I guess it goes without saying-- don't bring a knife to a gunfight! 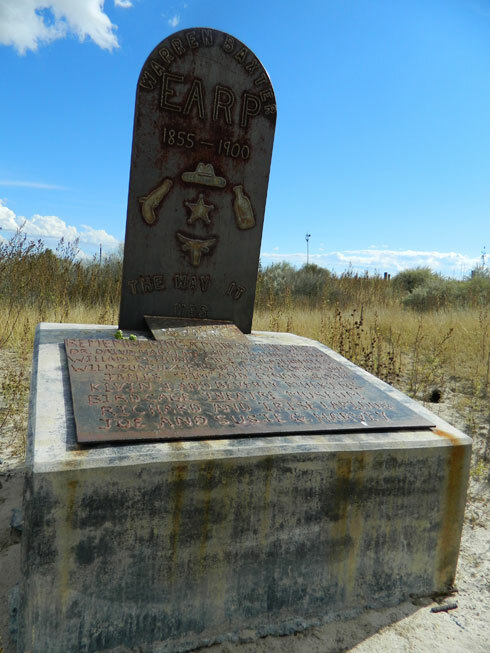 You'll find this Earp buried in the southeastern corner Old Willcox Cemetery-- 454 N 3rd Ave. I absolutely LOVE Willcox, Arizona. When I lived in Tucson, I was out there quite frequently-- mostly to go to Apple Annie's for their you-pick-produce-- apples, peaches, etc. It's also where we would go to pick the perfect carving pumpkins in the fall. I adore the southeast part of the state-- it's so rich with history, like this story about the lesser-known Earp brother. Awesome story! I never knew there was another lessor known Earp brother. Thanks for the post! I can imagine your surprise-- I can't remember how I found out about it, but it certainly was a shock. I just had to go find him! I also made sure it was easier for other adventurers to find him-- I added the cemetery to Google Maps.... took me a bit of digging to find the cemetery, and then get the courage to go out there. There was this crazy-scary woman sleeping in a van when I first went there... we drove by, and came back a couple hours later and she was gone. LOL. 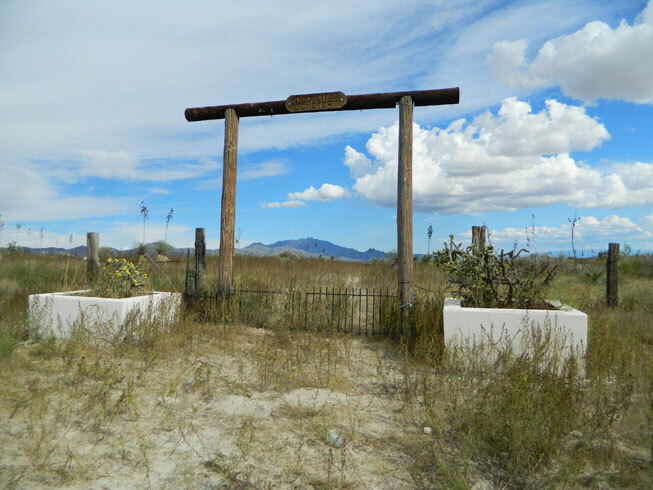 One of my college roommates is from Willcox, and she said the old cemetery is where all the high school kids go to sow their wild oats!